Appliance cabinets have been designed to accommodate side burners, gourmet power burners in both standard height and new low version for "boils", refreshment/bartending centers, sear pods, pizza ovens, egg smoker grills, etc. Appliance bases are specified 6" wider than appliance width. Include manufacturer's name and specifications for quote or with order. A "trim kit" is specifically designed for every major manufacturer's appliance to insure a proper fit. At Danver, we consider every project to be our most important - no matter how large or small. 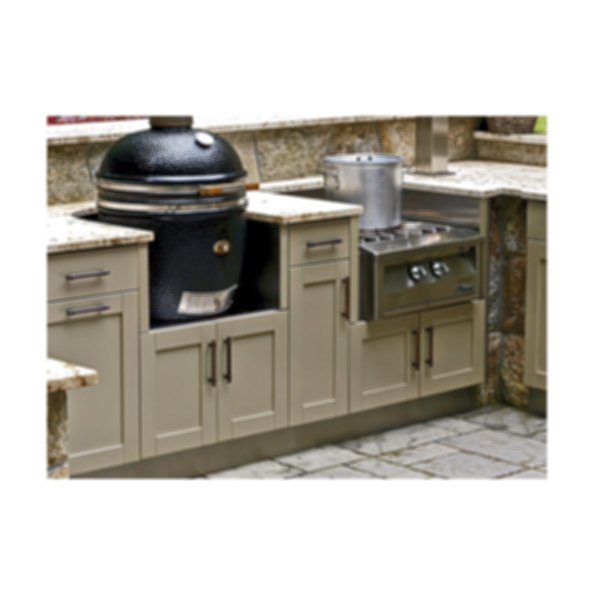 Outdoor room designers will work with you throughout the entire process to bring your custom outdoor kitchen to life from the initial design to shipment and installation. When you collaborate with us, there is nothing that cannot be done - literally. From creating straight runs, 45° runs and 90° "L" shapes to "U" shapes and galley kitchens ...to constructing shapes that only exist in your mind; we'll assist in bringing these ideas to fruition. With almost 400 choices in cabinet sizes we can accommodate almost any kitchen layout or challenging footprint. After one conversation with one of our outdoor room designers, you'll realize that we are dedicated to engaging in a relationship with each of our customers. We are here to answer your questions to provide and outdoor cooking area customized especially for you. We can work with your builder, contractor, architect, designer or yourself to complete the project. Danver Stainless Steel cabinetry is built to last ...and our lifetime warranty is proof!